Thanks everyone for participating in "Revolution 2020 @ Rs. 20" contest and referring your friends. We are really amazed to see so many people participating to get the latest book Revolution 2020 by Chetan Bhagat @ Rs. 20. 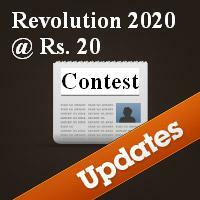 More than two lakh people have already been referred to buy Revolution 2020 @ Rs. 20. The contest is live from last 28 days and the amazing participation by all of you made us to extend the contest till 7th of October 2011 from its original closing date 30th September 2011. We have emailed the Gift Certificate to the winners till 30th September 2011 on 1st October 2011 to buy the book @ Rs. 20. So if you were expecting your name to be in the winners list, do check your email inbox! Winners till 7th October 2011 will receive Gift Certificates to buy the book at Rs. 20 on 8th October 2011, again don't forget to check your email inbox. We also have a Bumper Prize of Rs. 20,020 waiting for you! If 20 of your friends come and register for the contest, you stand a chance to win Rs. 20,020. So what are you waiting for, the contest will end on 30th September 2011. Click here to start sharing. Hi, certificate not recieved and customer support not responding.